On most nights, during the 1930s, the airwaves over North America were dominated by a single radio station called WLW. Transmitting at a power of half million watts, it was the most powerful, legally-operating, radio station in the world. So much energy was pumped through the atmosphere that street lights in the neighborhood flickered and radio receivers rattled in tune with the modulation peaks. One gas station near the eight-hundred-foot-tall transmitting tower outside Cincinnati, Ohio, just couldn’t turn off the lights. There are many stories from that period about people hearing broadcasts from barbed wire fences, rain gutters, bedsprings, water faucets, and radiators. Whether or not you want to believe these stories is up to you, but radio waves—especially a strong one—can actually do many of these things. The presence of the station in the air could indeed be physically felt. WLW was started by radio broadcasting pioneer and radio equipment manufacturer, Powel Crosley Jr, in 1922. Crosley was a visionary and a brilliant man who involved himself in all manner of products and activities. He was the one who added shelves to refrigerator doors and push buttons to car radios. He brought disc brakes to American cars and the first compact car to American consumers. Crosley entered the radio manufacturing business with the intention of making radios affordable to the masses. The first receivers he made was priced at only $7 a piece; equivalent models from other manufacturers sold at over a hundred dollars. Soon Crosley became the leading manufacturer of inexpensive sets, and the largest radio manufacturer in the world within four years. A 50 kilowatts signal is already loud enough to be heard over half the country, but Crosley still was not satisfied. In 1932, he applied for a license to transmit at 500 kW and was granted. The Federal Radio Commission (now the Federal Communications Commission) wanted to find out how much radio service the listener might gain by boosting the broadcasting power. Crosley hired three major electronics company—RCA, General Electric, and Westinghouse—to build a colossal transmitter that occupied several buildings and looked like a power plant with rows of transformers, five-foot-tall water-cooled amplifying tubes, and large DC generators. It even had its own cooling pond. The transmitter was coupled with a new antenna—800-foot tall and shaped like a diamond. For a very brief period, it was one of the world's tallest structures. Seeing the potential of high-power transmission, fifteen competing stations filed for 500 kW but none were authorized. They cried foul and turned up the legal heat on both the WLW and the FRC. Every six months Crosley’s lawyers pleaded and argued with the FRC for yet another 6-month extension of the experimental authorization. Unbelievably, this went on for five years, until the US Senate forbade any station from transmitting at power greater than 50 kW. Crosley fought the decision in court, but after a year, having exhausted all appeals, had to shut down the amplifiers. During the five-year period of super-power transmission, the WLW produced hundreds of hours of program including the earliest soap operas. It launched the careers of many radio stars, including Ma Perkins, Andy Williams, Rosemary and Betty Clooney, Red Skelton, and Fats Waller. Briefly, during the Second World War, WLW’s high-power transmitters were switched on again for war transmission. The broadcasts from Ohio could be heard as far away as South America and Europe. 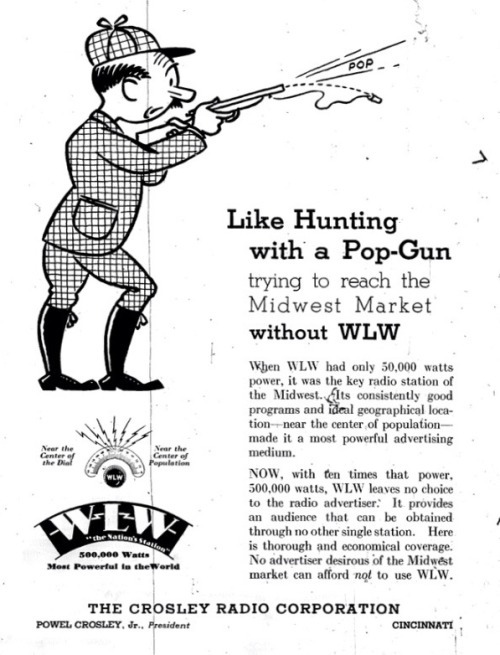 After the end of the war, Crosley sold WLW to the Aviation Corporation, having lost the interest in radio broadcast after his transmission power was restricted. WLW is currently owned by iHeartMedia. 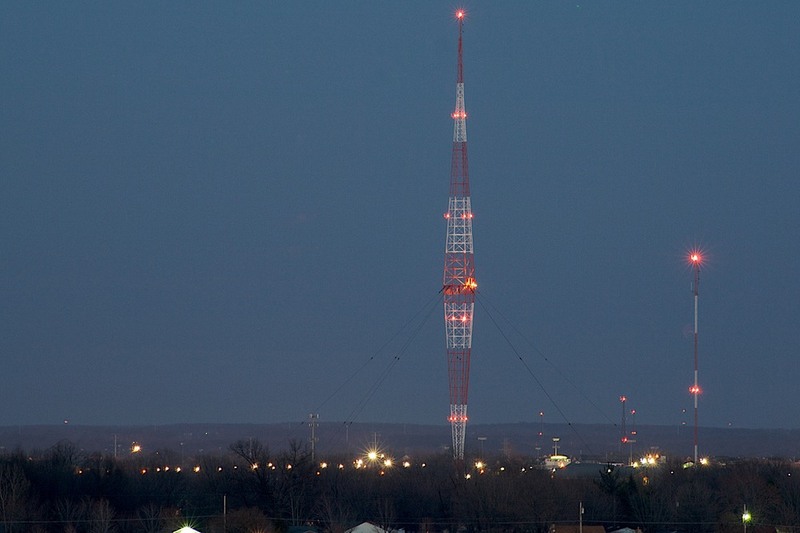 It continues to broadcast at 700 KHz with a power of 50 kW from the diamond-shaped Blaw-Knox radio tower in Cincinnati.